A Passive House (PassivHaus in German) is a building standard that is truly energy efficient, comfortable, affordable, and ecological at the same time. A Passive House provides a comfortable and healthy indoor climate without the need to use active heating or cooling appliances. It heats and cools itself. Passive Houses allow for energy savings of up to 90% compared with typical central European buildings, and over 75% compared with average new constructions. 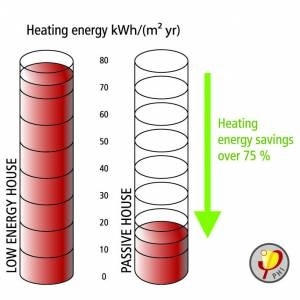 In terms of heating oil, Passive Houses use less than 1.5 litres per square meter of living space per year – far less than typical low-energy buildings. Similar energy savings have been demonstrated in warm climates where buildings require more energy for cooling than for heating. 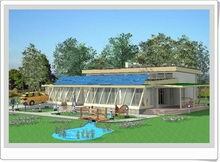 Passive Houses are also praised for their high level of comfort. They use energy sources inside the building such as body heat from the residents or solar heat within the building – making heating a lot easier. Special windows, entry doors and a building shell designed as highly insulated exterior walls, roof, and floor slabs keep the desirable warmth in the house – or undesirable heat out. A ventilation system consistently supplies fresh air making for superior air quality without causing any unpleasant droughts. A highly efficient heat recovery unit allows for the heat contained in the exhaust air to be re-used. The vast energy savings in Passive Houses are achieved by using special energy efficient building components, and a very efficient heat recovery ventilation system. There is absolutely no cutting back on comfort. Instead, the level of comfort is considerably increased. 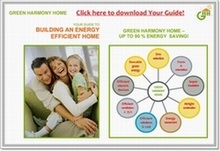 The Passive House is the world's leading standard in energy-efficient construction. A Passive House requires as little as 10 percent of the energy used by typical central European buildings – meaning an energy savings of up to 90 percent. Owners of Passive Houses are barely concerned with increasing energy prices. 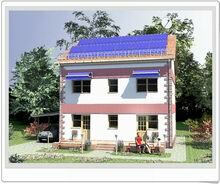 Passive Houses require less than 15 kWh/(m²yr) for heating or cooling (relative to the living space). The heating/cooling load is limited to a maximum of 10 W/m2. Primary energy use may not exceed 120 kWh/(m²a). Passive Houses must be airtight with air change rates being limited to n50 = 0.6/h. In warmer climates and/or during summer months, excessive temperatures may not occur more than 10 % of the time. These figures are verified at the design stage using the Passive House Planning Package (PHPP). As newer buildings are increasingly airtight, ventilation through joints and cracks alone is not sufficient to provide for fresh indoor air. Opening the windows as recommended won’t do the job either. Fresh air is not merely a matter of comfort but a necessity for healthy living. Ventilation systems are therefore the key technology for all future residential buildings and retrofits. Even though ventilation systems do require an extra investment to begin with, they will end up saving considerable amounts of energy costs provided that they are highly efficient systems. Highly efficient Passive House quality ventilation systems reduce the operating costs of any building. This is where the Passive House concept comes in: As large amounts of fresh outdoor air need to be supplied to the building anyway, why not use this air for heating? - Without any extra amounts of air, without any recirculation of air, without any inconvenient noise or drafts? This way the ventilation system pays off twice. This “supply air heating” concept only works in extremely well insulated buildings – that is in Passive Houses. In expert terms: The transmission heating load must be less than 10 W/m² to make sure that the required heat can be provided by the supplying air.